Network Rail is warning passengers to plan their journeys carefully ahead of the August Bank Holiday weekend of August 26/27. The company says the £133 million being spent on maintenance and upgrades over the weekend is “unprecedented”. Many London stations including Blackfriars, Cannon Street, Charing Cross, Euston, Liverpool Street, London Bridge, Paddington and Waterloo will have reduced services, and trains running from unaffected termini are expected to be much busier. Among the biggest projects are that at Waterloo (see separate story), while Euston will be closed for HS2 enabling works on August 26/27. 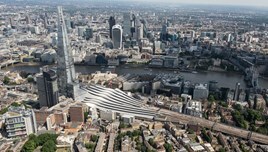 London Bridge will have fewer trains from August 26 to September 2, and there will be no Southeastern trains to or from Cannon Street on August 26/27 or to Blackfriars from August 28 to September 2. Crossrail overhead line electrification works at Brentford will reduce the number of trains from Liverpool Street to Shenfield, Ingatestone and Billericay over the weekend, while at Paddington engineering between Swindon and Bristol Parkway will reduce the number of trains operating to Bristol, with some diverted. At London Bridge, Charing Cross and Waterloo East, Southeastern will operate no services from August 26 to September 2, while Southern will operate a reduced timetable to and from London Bridge over the Bank Holiday weekend. No London Midland trains south of Hemel Hempstead on 26 August, south of Milton Keynes Central on 27 August. Bus connections to Stanmore (Jubilee Line) both days. Milton Keynes - London timetabled for 3 to 4 hours. Not sure what all this has to do with HS2. Southern's East Croydon-Milton Keynes service will/will not run on Saturday 26 August depending on which travel planner you choose to believe. Milton Keynes Central one of the busiest stations on the WCML. Whose funding the lost revenue? Potentially HS2 works could go on at Euston for the next 7 years. Southern provides connections to Central London at Wembley, Shepherds Bush, West Brompton and Clapham Junction. No reason why shouldn't run to Milton Keynes late on Saturday and all-day Sunday. Time for Network Rail, London Midland and Southern to get together and sort out a sensible alternative service that doesn't tell the paying customer to (readers invited to supply suitable expletives).